The Hello, Welcome arts consortium held their Tooth and Nail female mural competition at The Icehouse in Long Beach on Saturday. Photo by Bill Alkofer. 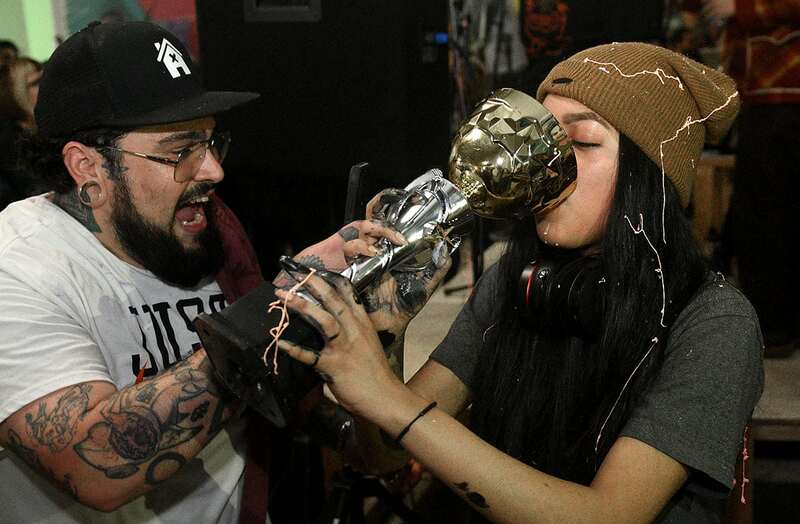 Alepsis Hernandez hoisted the victory cup at the inaugural Tooth and Nail female art battle at the Icehouse Arts Complex in Long Beach on Saturday. She squashed her three foes and then gulped down a beer that she had poured into the championship chalice. 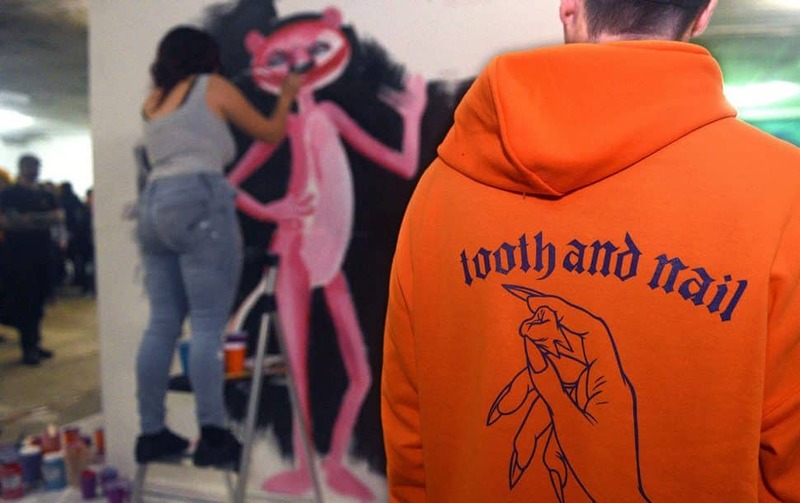 Tooth and Nail was billed as a live female art battle hosted by “Hello, Welcome”—a recently formed arts consortium that operates out of the fifth floor of the Icehouse. The event was organized by Allison Bamcat, one of the competitors. A dozen Hello, Welcome staff members judged 30 applicants and decided upon the four women who would be in the contest. 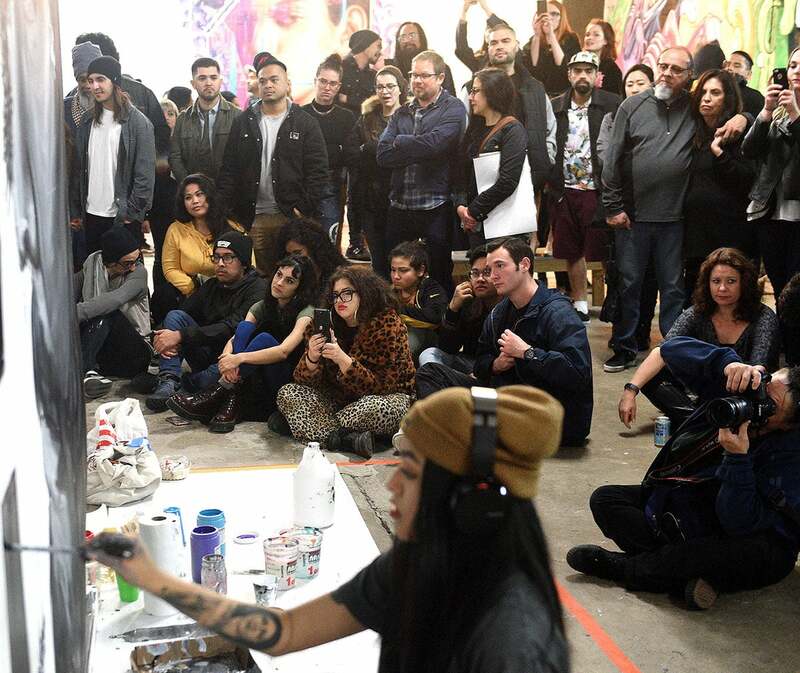 The artists had 90 minutes to create a mural on a 12-by-12-foot wall. 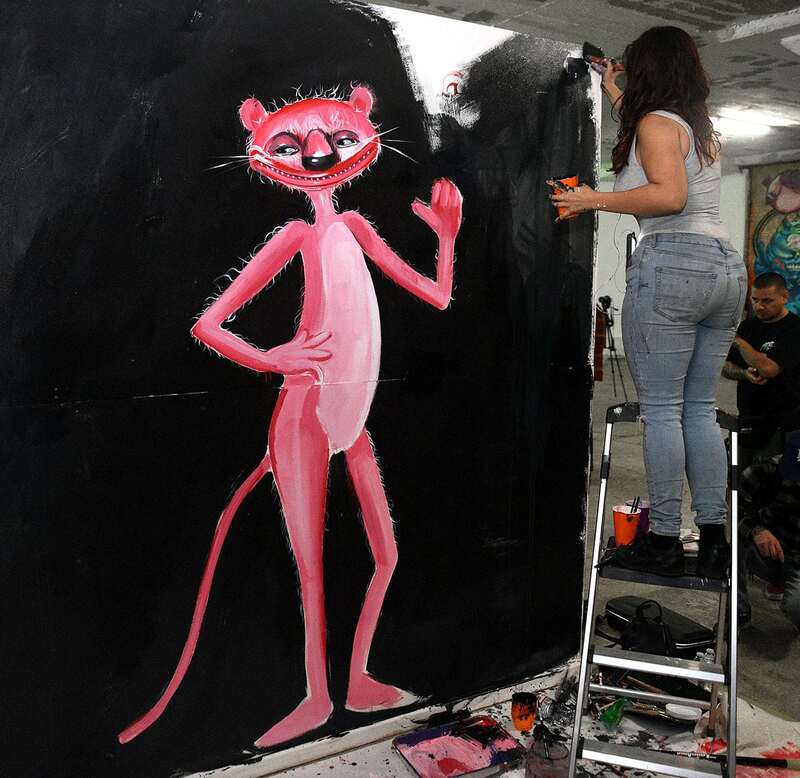 A paint-spattered Michelle Ruby Guerrero said she was exhausted after spending an hour and a half creating “Chucho Imitating the Pink Panther”. 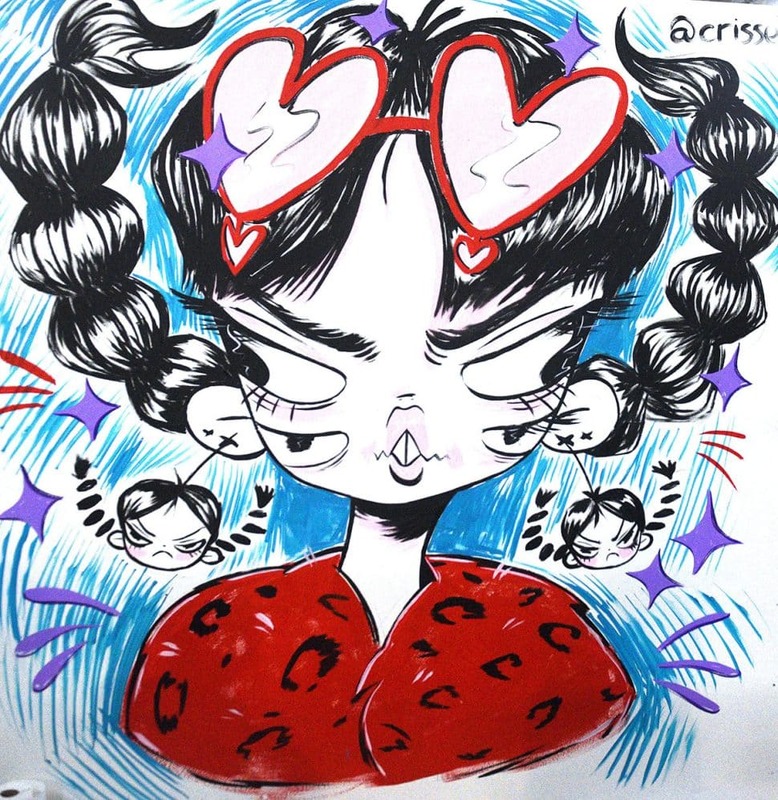 “This was a 90-minute workout for my body and my brain,” she said. 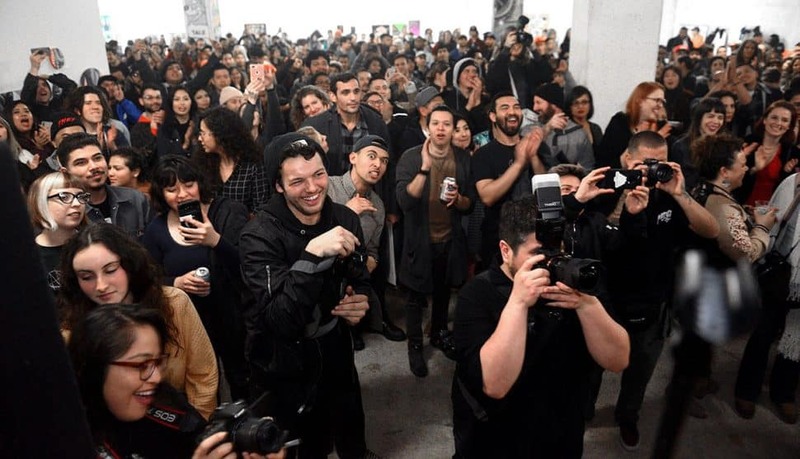 When time ran out, the women were judged by the volume of the cheers from the more than 400 people who climbed up the stairs to take in the competition. A decibel meter determined Hernandez was the victor. 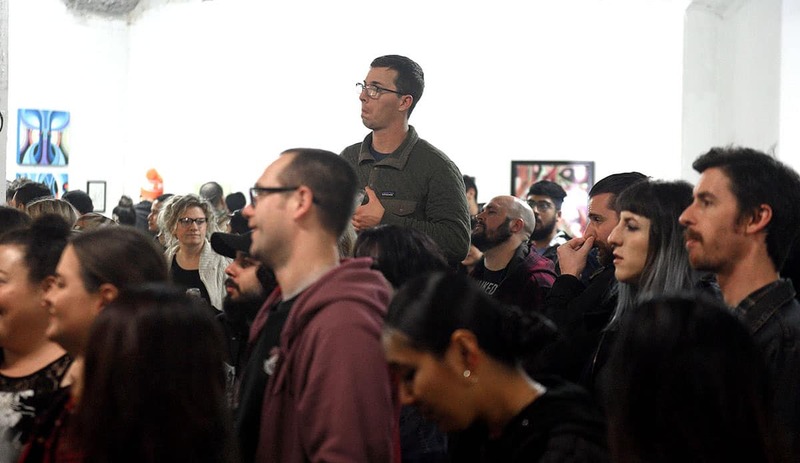 Lisa DeSmidt of the Arts Council for Long Beach was on hand to watch the battle. She was impressed by both the event and the Hello, Welcome arts group in general. Bamcat had assembled a team if should she need any help (she didn’t). One of the squad members was Joey Stupor. 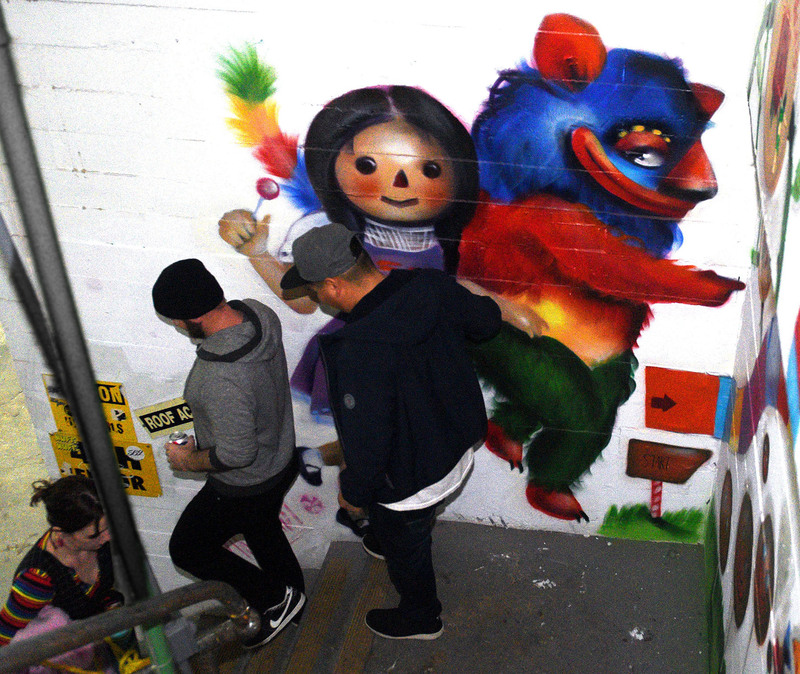 Michelle Ruby Guerrero’s mural was titled “Chucho Imitating The Pink Panther.” Photo by Bill Alkofer. 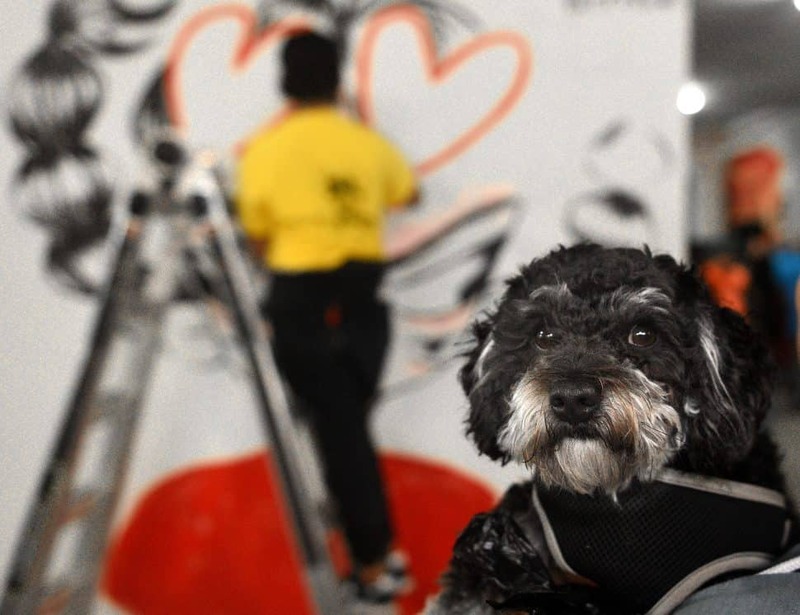 Much of Michelle Ruby Guerrero’s artwork is based on her character “Chucho.” He’s painted on the staircase at the Icehouse Arts Complex on Saturday. Photo by Bill Alkofer. 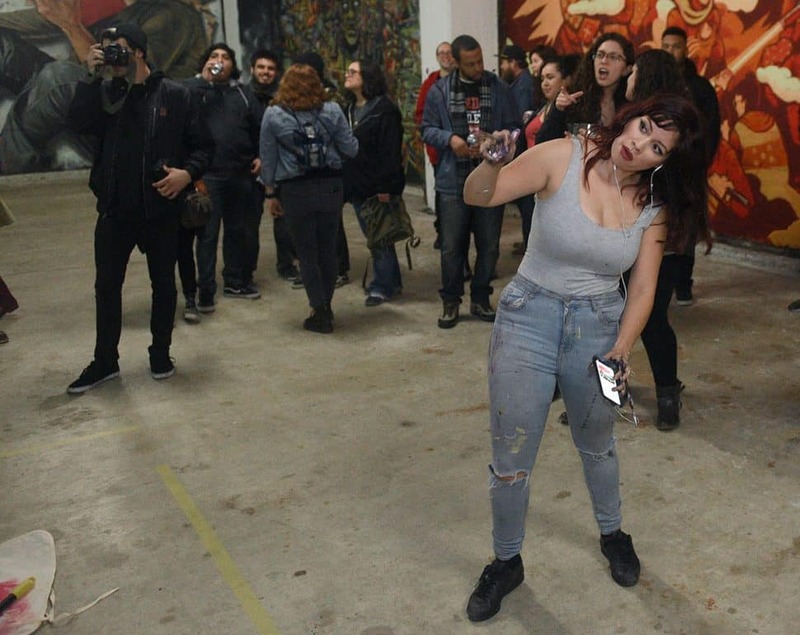 Serena Au, volunteer coordinator, celebrates the end of the judging at the Tooth and Nail painting competition at the Icehouse Arts Complex on Saturday. Photo by Bill Alkofer. 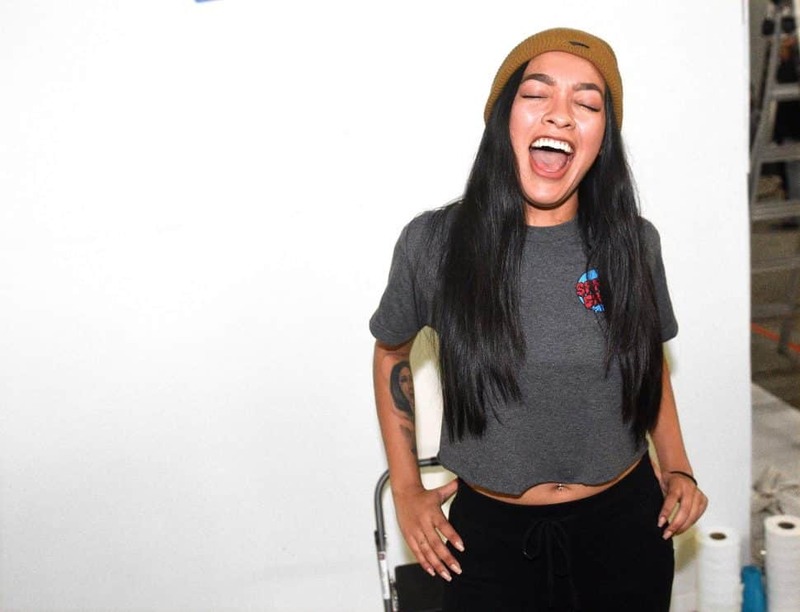 Allisons Bamcat encourages her fans to cheer during the judging of the Tooth and Nail painting competition at the Icehouse Arts Complex on Saturday. Photo by Bill Alkofer. 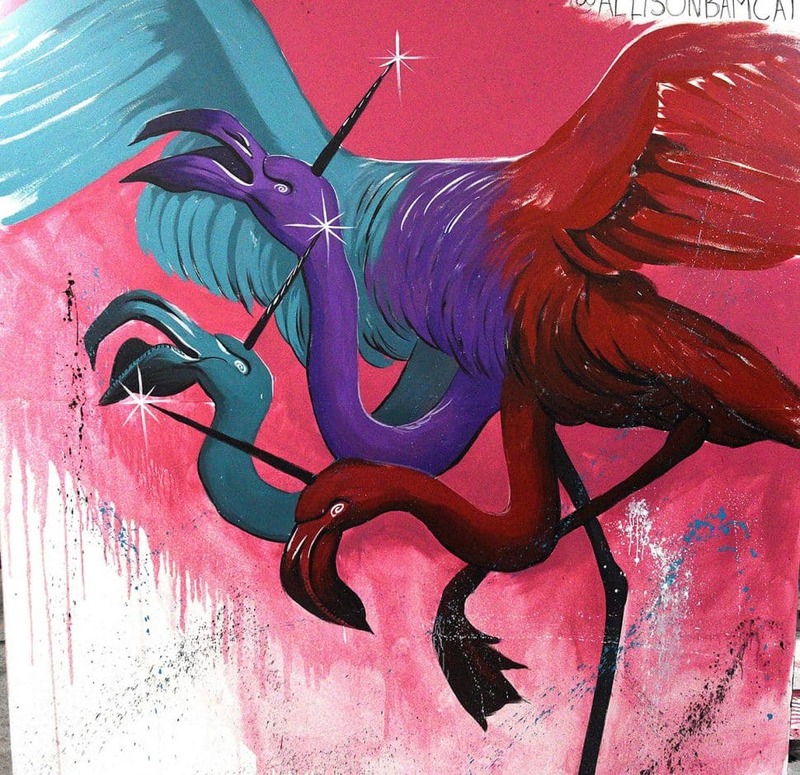 Allison Bamcat’s mural was a three-headed flamingo unicorn. Photo by Bill Alkofer. 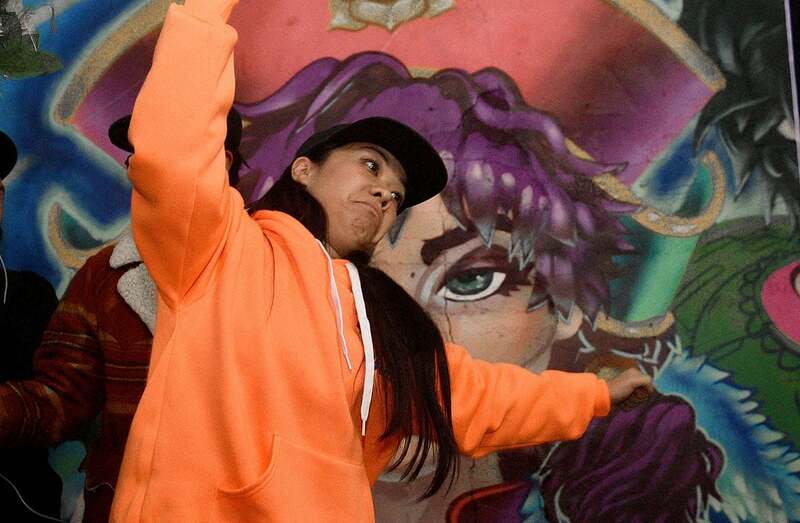 Crisselle Mendiola’s mural was titled “Diva Lady.” Photo by Bill Alkofer. 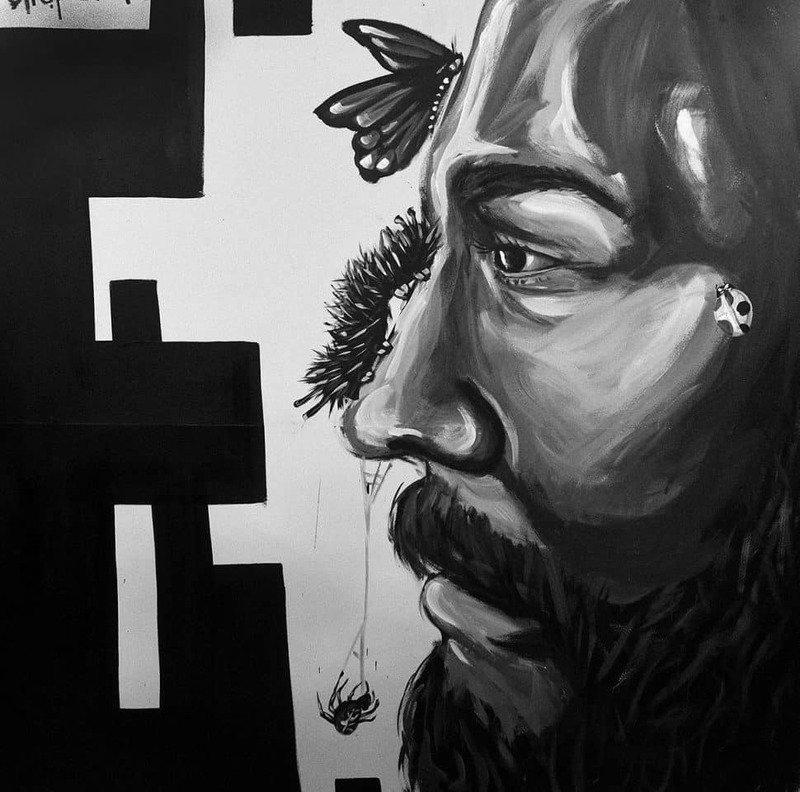 Alepsis Hernandez’ winning mural is titled: “The True Meaning of a Man.” Photo by Bill Alkofer. Alepsis Hernandez drinks a Coors out the championship cup at the Tooth and Nail painting competition at the Icehouse Arts Complex on Saturday. Photo by Bill Alkofer. More than 400 people voted by cheer at the Tooth and Nail painting competition at the Icehouse Arts Complex on Saturday. Photo by Bill Alkofer. 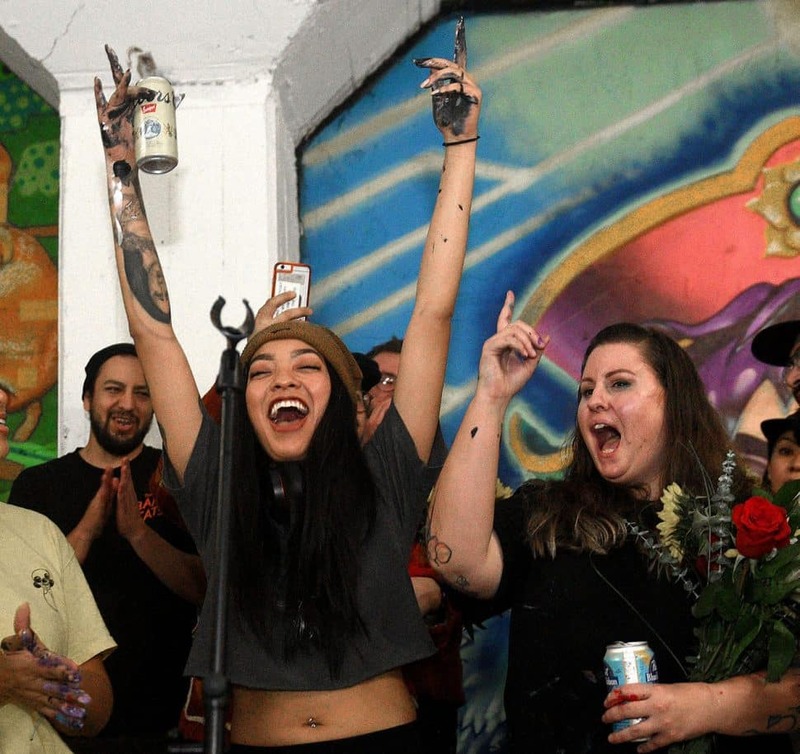 Alepsis Hernandez, left, celebrates her victory at the Tooth and Nail painting competition at the Icehouse Arts Complex on Saturday. Photo by Bill Alkofer. 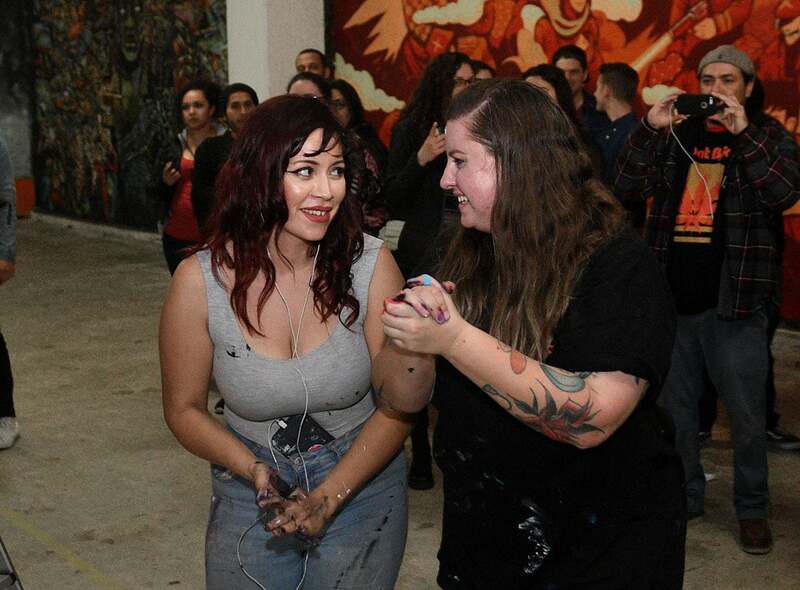 Allison Bamcat and Michelle Ruby Guerrero checked out each other’s murals at the end of the Tooth and Nail painting competition at the Icehouse Arts Complex on Saturday. Photo by Bill Alkofer. 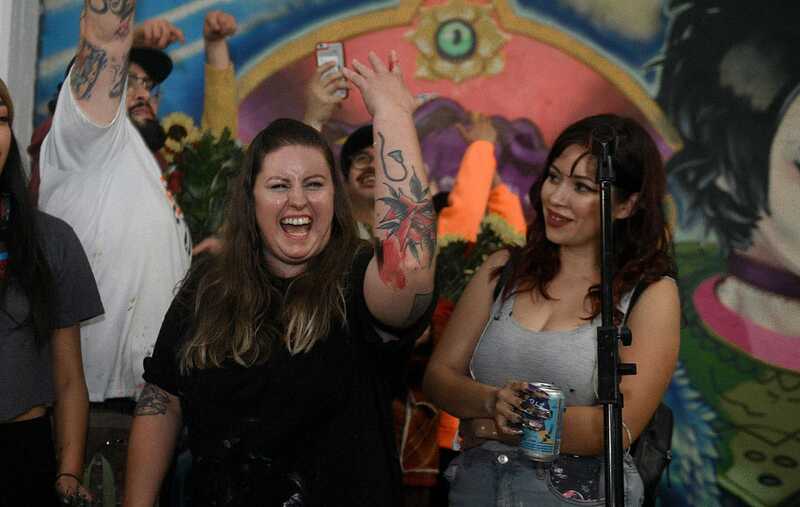 Allison Bamcat laughs at the end of the mural painting competition, Tooth and Nail, at the Icehouse Arts Complex on Saturday. Photo by Bill Alkofer. 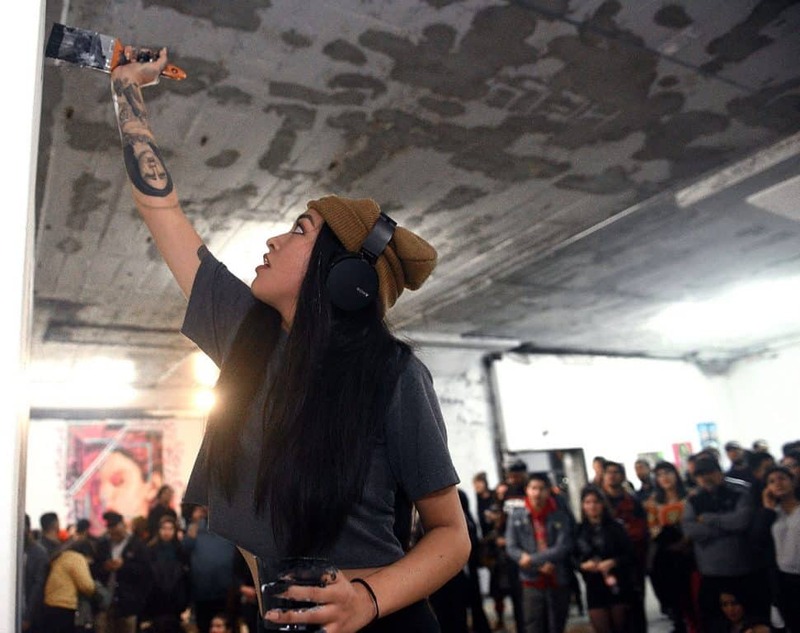 Michelle Ruby Guerrero checks the perspective of her mural at the Icehouse Arts Complex on Saturday. Photo by Bill Alkofer. Crisselle Mendiola stands on a ladder while she works on her mural at the Icehouse Arts Complex on Saturday. Photo by Bill Alkofer. 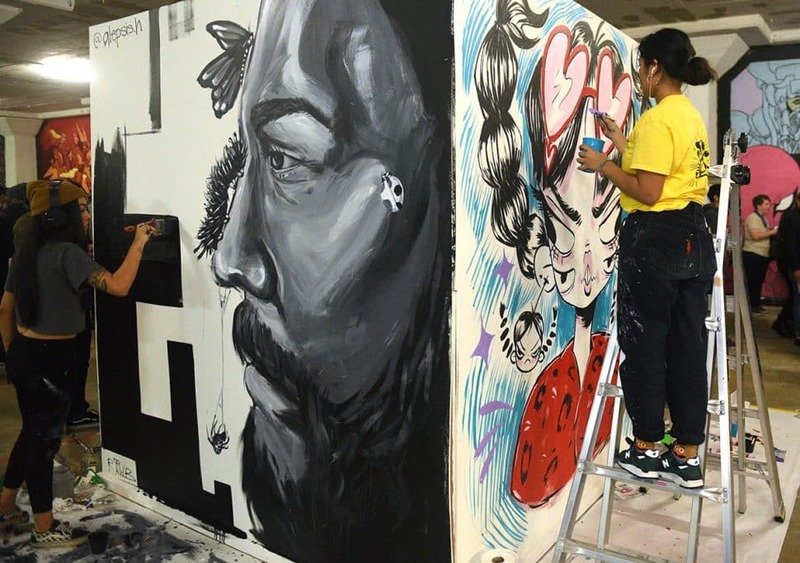 Alepsis Hernandez and Crisselle Mendiola work on their murals during Tooth and Nail at the Icehouse Arts Complex on Saturday. Photo by Bill Alkofer. Allison Bamcat paints her mural at the Icehouse Arts Complex on Saturday. Photo by Bill Alkofer. 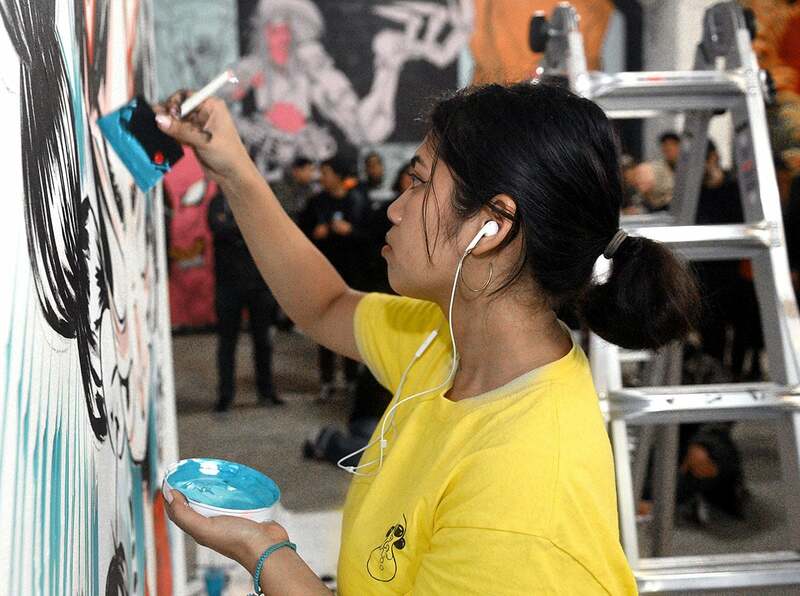 Alepsis Hernandez paints her mural at the Icehouse Arts Complex on Saturday. Photo by Bill Alkofer. 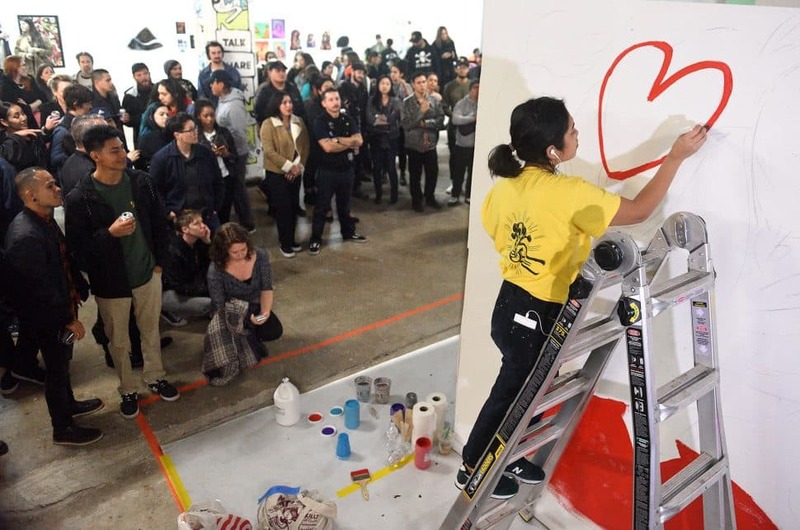 The Hello, Welcome arts consortium held their Tooth and Nail female mural competition at The Icehouse in Long Beach on Saturday, Feb. 2, 2019. Photo by Bill Alkofer. 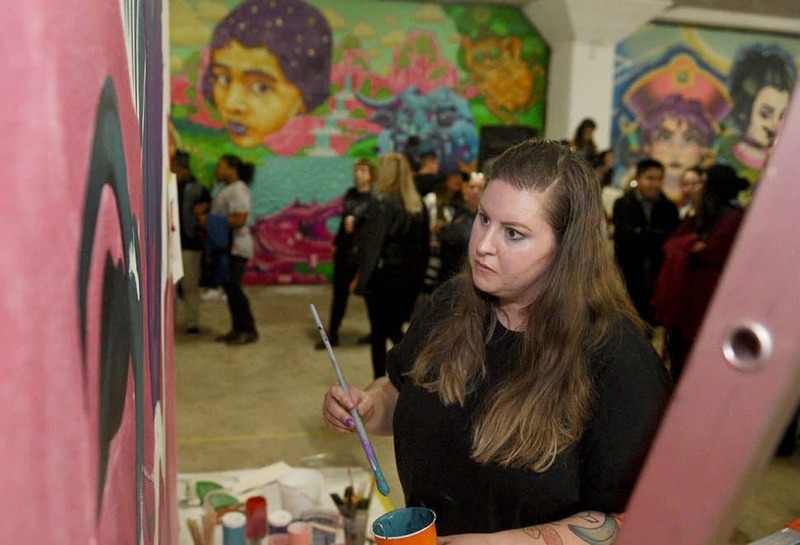 Allison Bamcat studies her mural during the Tooth and Nail female painting competition at the Icehouse Arts Complex on Saturday. Photo by Bill Alkofer. 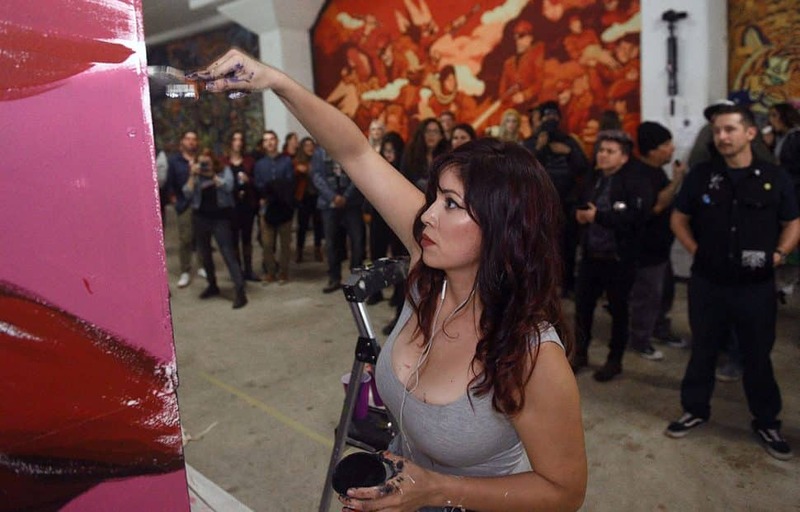 Michelle Ruby Guerrero paints the edge of her mural. Photo by Bill Alkofer. Crisselle Mendiola paints her mural. Photo by Bill Alkofer. 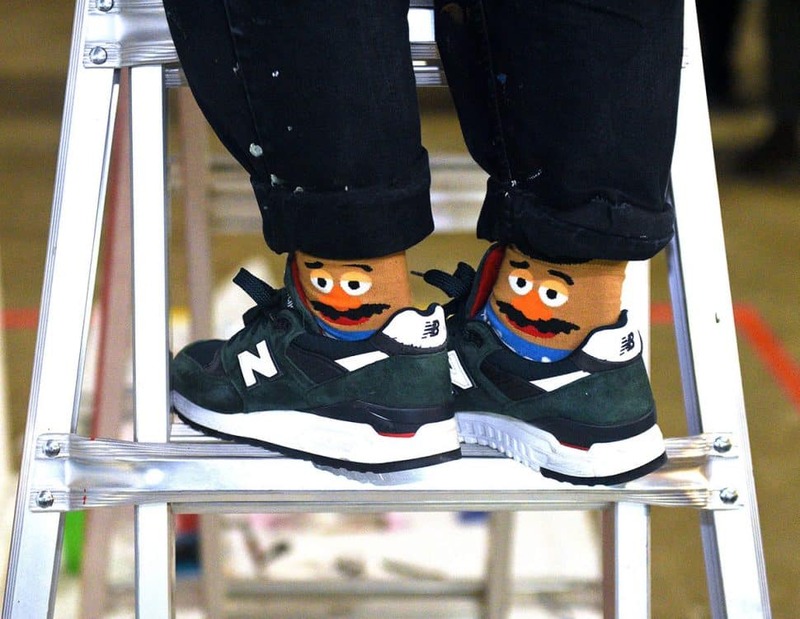 Alepsis Hernandez paints her mural. Photo by Bill Alkofer. 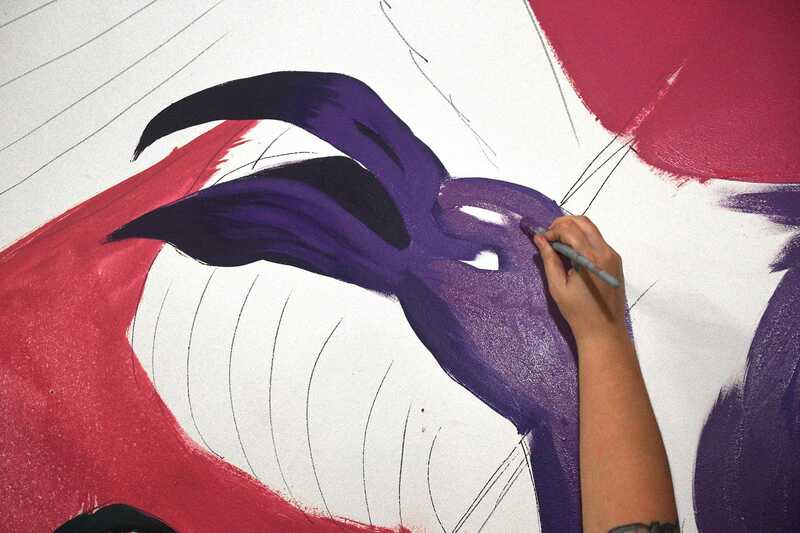 Michelle Ruby Guerrero paints a detail of her mural. Photo by Bill Alkofer. 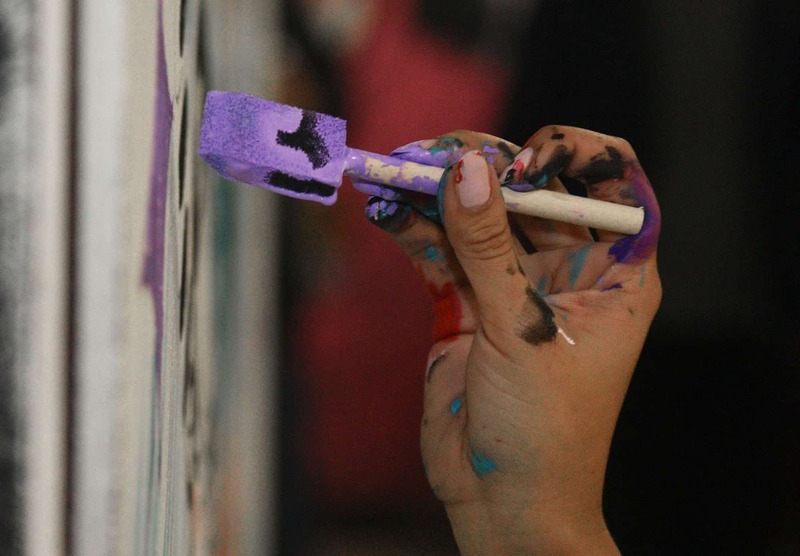 More than 400 people attended the the Tooth and Nail female painting competition. Photo by Bill Alkofer. 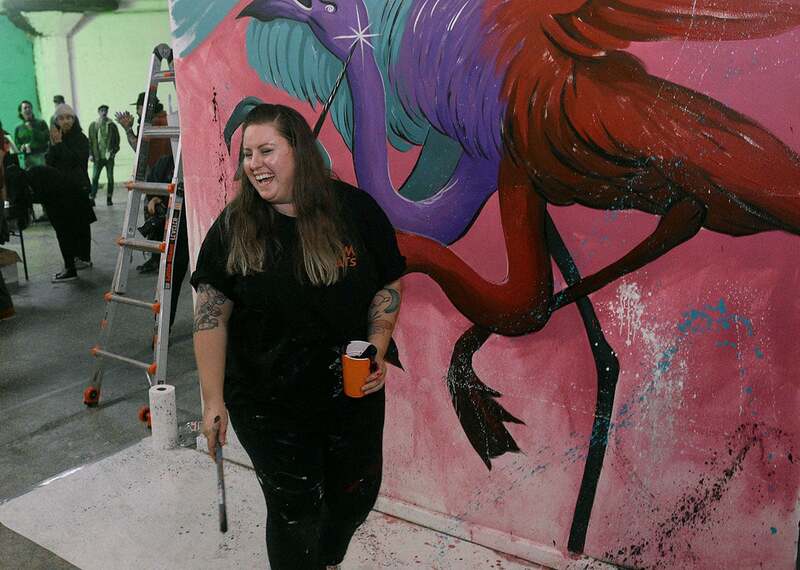 Allison Bamcat works on a flamingo which was part of her mural. Photo by Bill Alkofer. 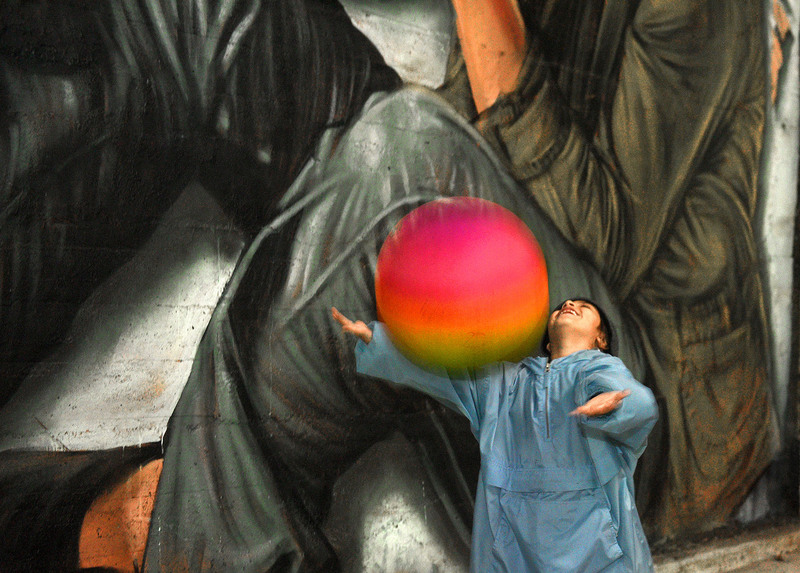 Irving Arechiga plays with a ball during the Tooth and Nail female painting competition.Photo by Bill Alkofer. Michael Martinez dances. Photo by Bill Alkofer. A dog named Charlie checked out the competition. Photo by Bill Alkofer. Mr B Baby looks at a photo of The Pink Panther, one of the elements of her mural. Photo by Bill Alkofer. 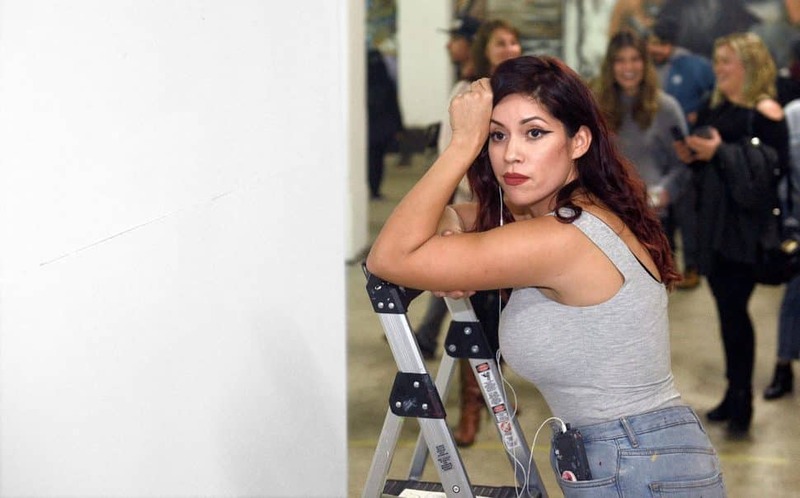 Michelle Ruby Guerrero (Mr B Baby) has a moment of reflection before the start of the Tooth and Nail female painting competition. Photo by Bill Alkofer. 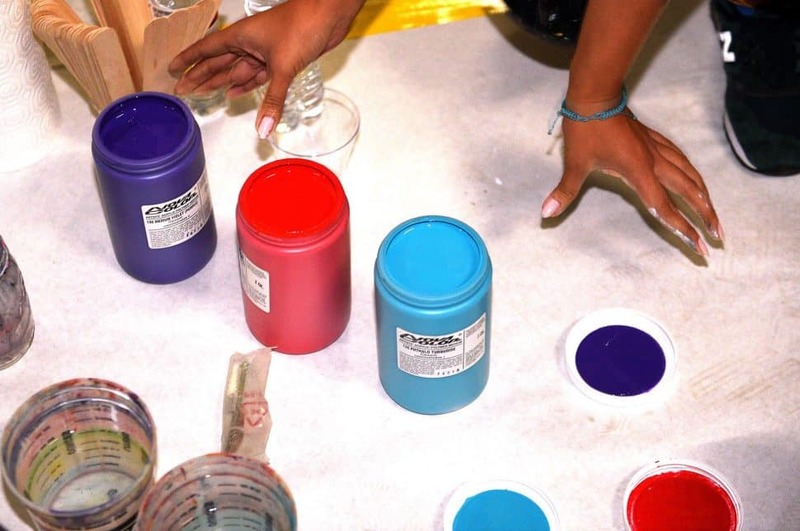 Alepsis Hernandez arranges her paints. Photo by Bill Alkofer. Alepsis Hernandez lets out a cheer before the start of the competition. Photo by Bill Alkofer. 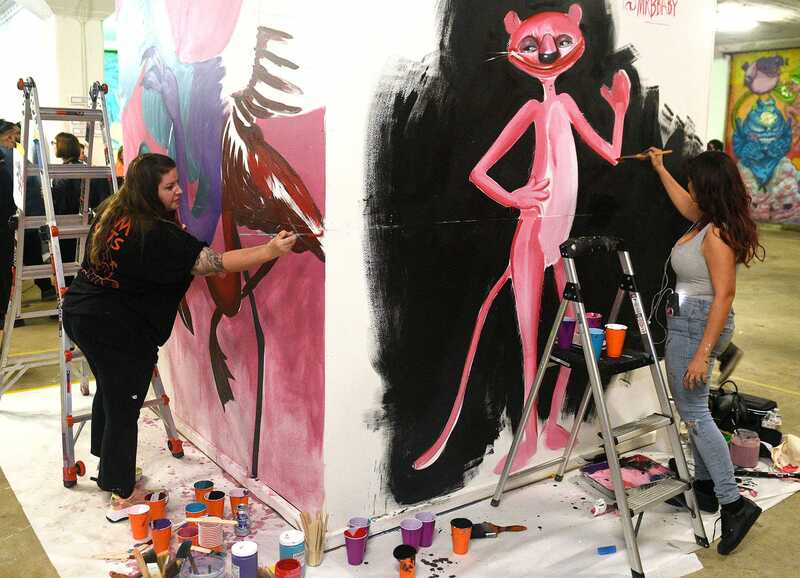 Allison Bamcat and Michelle Ruby Guerrero work on their murals. Photo by Bill Alkofer. 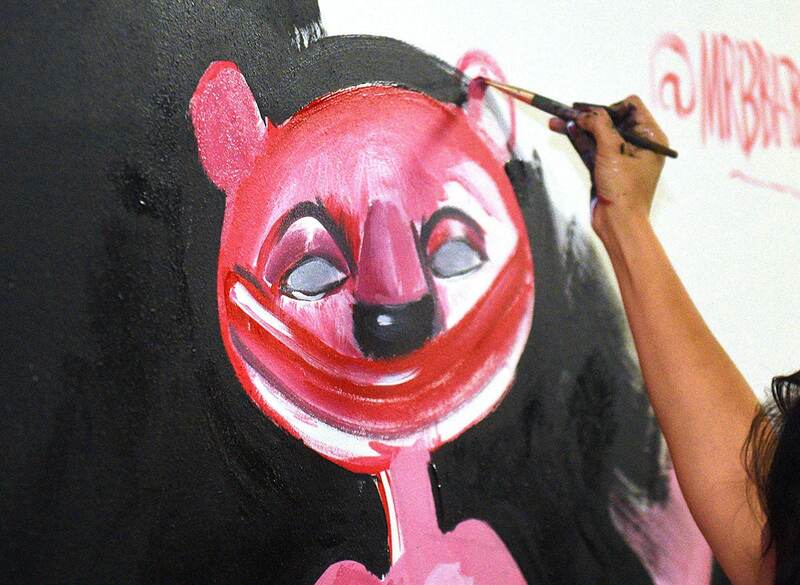 Crisselle Mendiola starts her mural. Photo by Bill Alkofer.